The above phrase translated from Solomon’s Book of Proverbs is said to be the first sentence to be written down in Armenian by Mashtots after his recovery of the Armenian alphabet. Armenian literary tradition dates back to times immemorial. In Armenian mythology there exist deities and spirits of writing and literature. Like the god of literature Tir and the spirit writer Grogh. 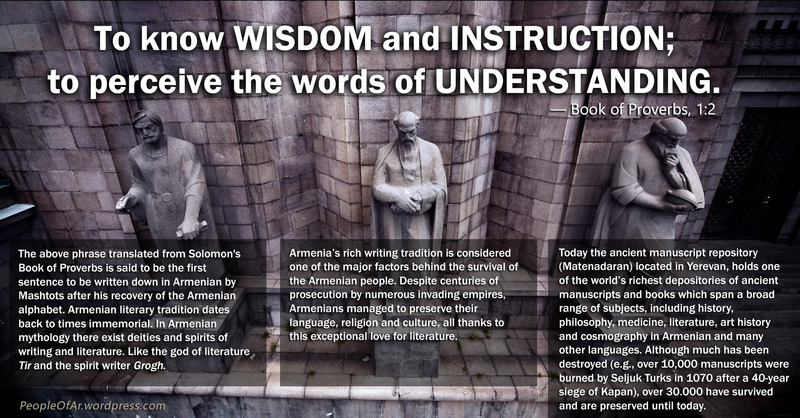 Armenia’s rich writing tradition is considered one of the major factors behind the survival of the Armenian people. Despite centuries of prosecution by numerous invading empires, Armenians managed to preserve their language, religion and culture, all thanks to this exceptional love for literature. Today the ancient manuscript repository (Matenadaran) located in Yerevan, holds one of the world’s richest depositories of ancient manuscripts and books which span a broad range of subjects, including history, philosophy, medicine, literature, art history and cosmography in Armenian and many other languages. Although much has been destroyed (e.g., over 10,000 manuscripts were burned by Seljuk Turks in 1070 after a 40-year siege of Kapan), over 30.000 have survived and are preserved until today. Previous Article East of Byzantium in need of funding!